Oman’s most successful motor racing export, Blancpain Endurance Series and Avon Tyres British GT Championship competitor Ahmad Al Harthy, has today been appointed as brand ambassador for Aston Martin Middle East and North Africa. 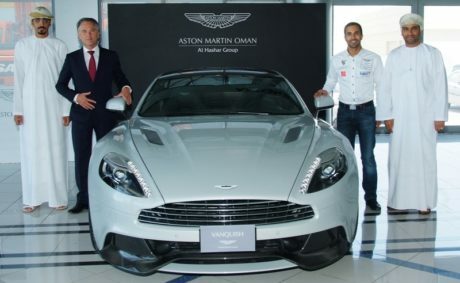 Not only underlining the Muscat 33-year-old’s status and his strong links with the hugely successful global automotive brand, the high-profile partnership also highlights Aston Martin’s support of the Omani’s endurance racing career. Additionally, the new appointment acknowledges the role Ahmad and the Oman Racing Team – with whom he competes across mainland Europe and in the UK – play in helping to promote Aston Martin at home and abroad. “We are absolutely delighted to confirm Ahmad’s appointment as brand ambassador”, said Neil Slade, General Manager of Aston Martin Middle East and North Africa, “He is a major sporting role model in Oman and the Middle East [just last week awarded Oman Sportsman of the Year 2014] and his association with Aston Martin over the past couple of years through his motor racing makes this partnership the perfect fit. Alongside regular promotional work with Aston Martin in the Middle East and North Africa, Ahmad will also help to fly the flag for the brand on a day-to-day basis on the roads of Oman behind the wheel of brand new Aston Martin Vanquish. One of the Omani’s sponsors for a second year now is Al Hashar Group. The pioneering Al Hashar Group represents Aston Martin in Oman and has over 40 years’ experience in the automotive business. The group’s Chairman, Sheikh Al Muhannad Al Hashar, says Ahmad’s new role as brand ambassador with the manufacturer is a major source of pride for Oman and the region. For Ahmad himself, the new status is something he is extremely proud of and the international racer says the acknowledgement afforded him by Aston Martin is one of the proudest moments of his sporting career to date. “We’ve been involved with Aston Martin for a couple of years now in the Blancpain Endurance Series and British GT, but to have been invited to be brand ambassador for such a prestigious and globally renowned manufacturer is something unbelievably special”, he commented.